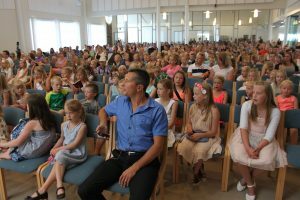 The Annual Summer Convention in Kållby/Kolppi in Pedersöre, Finland, will be arranged from the 10th to the 12th of August, and it is arranged by the Laestadian Prayer House Congregation in Kållby. Kållby is situated in the country side in Pedersöre municipality on the Finnish west coast. The Laestadian revival movement reached Kållby in the 1870’s. People gathered in homes until 1972. The first prayer house was built in 1991. At that time the congregation had about 240 members over the age of 18. The congregation has grown over the years and in 2009 a new and bigger prayer house was built. Today the number of members is 1030, of which 600 are over the age of 18. Summer conventions have been arranged here since the beginning of the 1930´s. 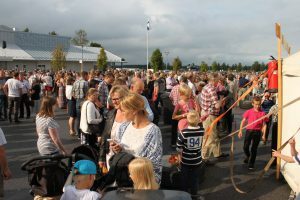 The convention is attended by people from the region and from other parts of Finland, and from Sweden and Norway, at times also from USA and Russia. The convention is bilingual. All sermons will be held either in Swedish or in Finnish and translated to the other language. You will hear this in the background. All sermons will be translated to English and streamed via internet. You can also listen to the sermons afterward.